My Little Pony has been a favourite with the kids since its conception in the 80s, and shows no signs in the slowing down of its popularity. It’s always been something more for kids rather than babies, but no longer because there’s a New My Little Pony Baby Range available at Tesco. There’s a great selection online at Tesco Direct, although do not worry when this online store closes, as many stores will stock them still. However, with this in mind, it might be prudent to take a look at the new range and order what you want just in case you do start to struggle to get these in your store. 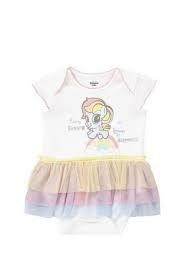 Below we have picked out our best choices from the New My Little Pony Baby Range at Tesco. Firstly there is this Hasbro My Little Pony Tutu Bodysuit, which will bring colour and texture to your little girl’s wardrobe. There’s the slogan, ‘Every Rainbow Brings Happiness’ and let’s not forget that adorable multicoloured tutu. Event though the weather has gotten warmer, there are still a few chilly days here and there, and so it would be handy to have this cute My Little Pony Sleeping Bag. The 2.5 Tog sleeping bag with its My Little Pony artwork will certainly keep baby warm. When your child is ready to transition from the potty to the toilet, then this My Little Pony Soft Padded Toilet Seat might be ideal for your little one. This encourages toilet training, is lightweight and portable, and also very easy to clean. Finally, we just had to mention this My Little Pony Pinkie Pie Ring Rattle that provides tactile and audio stimulation for baby and is easy for them to grab and play with. This is just a small selection from this new range, but you can view all of the products in the link in the second paragraph.